In Space, There’s a lot of People Screaming and We Love it. Does that make us Bad People? 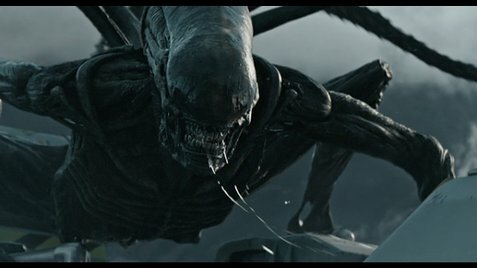 Alien: Covenant, the second in a series of prequels to the films that followed 1979’s Alien and a direct sequel to 2012’s Prometheus, splits its time evenly between more of the thoughtful confrontation of the origins of mankind shared by its immediate predecessor and the gruesome body horror of its spiritual forebears. It’s not exactly a new creation, but the return to the basics is quite effective, with screenwriters John Logan and Dante Harper relishing the opportunity to ask the Important Questions and director Ridley Scott clearly having a blast with returning to the iconography of a franchise he helped to create. The exploratory spaceship Prometheus is a bygone legend, its disappearance a ten-year-old mystery to those who have attempted to follow the doomed craft that left, it is believed, no survivors in its wake. A new crew of explorers, aboard the Covenant, have charted a course to a new system, hoping to set up a colony on a faraway planet that can sustain life. Its old captain dies in a freak encounter with a neutrino blast that damages the ship, and into his position a new captain, Oram (Billy Crudup, good as a man beyond his depth), is promoted, husband to the ship’s doctor Karine (Carmen Ejogo) and terrified at the mountain of responsibilities ahead of him. When a coded distress signal is intercepted on a previously unnoticed planet, also capable of sustaining life, Oram makes the decision to cut short what might be a years-long journey, much to the chagrin and protest of his second-in-command, Daniels (Katherine Waterston). The rest of the Covenant crew are split into two parts, with one part descending to the planet’s surface and the other remaining on the ship. Visiting the planet alongside Daniels, Oram, and Karine are Lope (Demián Bichir), Faris (Amy Seimetz), and a handful of interchangeable others. Present also for the exploration is Walter (Michael Fassbender), the resident “synthetic,” a remarkably humanoid, artificially intelligent android. His outer shell, especially to those who saw this film’s predecessor, will be familiar, and indeed, David (also played by Fassbender) returns to this narrative in a capacity that will not be fully revealed here. Fassbender’s dual performances are impressive, though, in ways that go beyond the superficial nuances (Walter speaks with an American accent to compare with David’s English one). David is malleable, creative, and cunning, with a genuine philosophy that has evolved over time. Walter is comparatively preprogrammed, with a limited range of evolution in his ability to adapt to external pressures. The actor makes sense of this through expertly attuned body language. The plot essentially bookends the film, with the alien virus causing its usual havoc to the crew in ways that lead to the thoracic explosions of guts and body parts that thankfully don’t compromise the carnage. The climax is a chase sequence involving the crew that stays behind on the mothership – including Faris’ husband Tennessee (Danny McBride) – and a revelation of the sort that reframes the ending to be almost pitilessly dark. It’s a bit predictable, though less so when the focus is on the philosophical dichotomy between two, artificially intelligent beings and, of course, their physical strength in a fight. Alien: Covenant does occasionally give in to formula, but the whole is properly thoughtful and very exciting.